Forums › Optics, Scopes, Rings, & Mounts › Leupold scope ??? I am simply wondering how on earth can the Leupolds be so light weight and have such crystal clear bright optics? scopes currently available for close focusing distances for air gun use (PCPs)? Any recommendations? Anything close? priced Bushnell and Sightron scopes. My recently purchased Aztec Emerald and MTC Viper Pro can't even compare! through them in the evening. The 4-12 Mark AR with Mildot will focus down to 25 yards and is another little lightweight badass. Plus I love the kinda tactical look of it . There's a reason Leupold continue s to keep their place at the head of the table . Great glass , lightweight, and killer customer service. Love my 3-9×33 EFR but would like to check out that Mark AR for the mildot reticle (or send mine into the custom shop). I agree they are very nice scopes with great glass. Love my 3-9x33 EFR but would like to check out that Mark AR for the mildot reticle (or send mine into the custom shop). I agree they are very nice scopes with great glass. 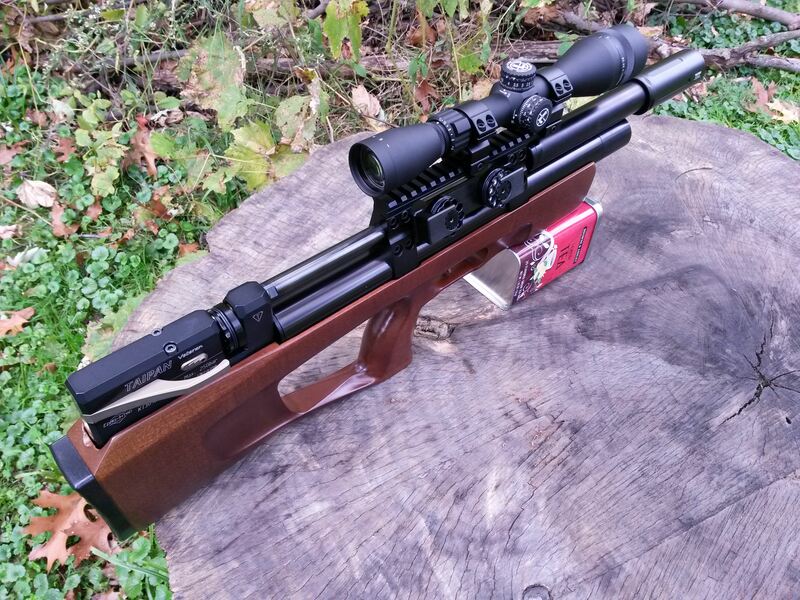 Their 35X competition scope is awesome for punching holes in paper….focuses easily down to <10yards. Their 35X competition scope is awesome for punching holes in paper....focuses easily down to <10yards. Been preaching it for years. Nobody listens to me. The Leupold 6.5×20-40 EFR is one of, if not the finest scope you can top an airgun with. Been preaching it for years. Nobody listens to me. The Leupold 6.5x20-40 EFR is one of, if not the finest scope you can top an airgun with. That's my "other" scope when not just pushing pellets and need more FOV. You are right, it's a winner! This reply was modified 5 months ago by FredAZ. Here's a Mark AR Mod 1 4-12×40 on my .25 shorty. It will focus under 20yds. Love it! Here's a Mark AR Mod 1 4-12x40 on my .25 shorty. It will focus under 20yds. Love it! Hey thanks for all of the replies! Keep them coming! I must add that the Leupold glass seems to not have any kind of yellowish tint or hue like some other scopes out there. Just clean and clear optics. It is really just too bad they don't make EFR side focus with mildot or mil reticles from the factory. The 6.5-20X40 EFR is a good, simple design, that has withstood the test of time in a world of heavy "Tactical" scopes. Lens size: The 40mm objective lens was standard on Leupold for many years for good reason. It permits the manufacturer to use better glass. The larger the lens, the harder (or more costly) it is to minimize chromatic aberration (.light dispersion ). If you have a 56mm lens and a 40mm lens at the same price point, the 40mm will have better glass. Objective focus: Objective focus uses at least one less lens than SF and will have a clearer sight picture at the same price point. Focal length: Objective focal length is the distance between the objective lens and the erector tube. Notice how long the front part of the tube is on this scope. Long focal length also mitigates aberration and enhances image quality in this scope. Simply put, Leupold got it right. Leupold Mark AR in 4-12 x 40 is phenomenal. So impressed with it that I am ordering it's big brother for an Edgun R5 I just purchased.